Globally, gold traded higher at $1,309.24 an ounce, while silver held steady at $15.63 an ounce in New York. On Thursday, gold prices had declined by Rs 270 to Rs. 34,180 per 10 grams at the bullion market. Gold prices were ruling flat at Rs 34,175 per 10 gram, while silver dropped by Rs 570 to Rs 40,930 per kg in the national capital on Friday, reported news agency Press Trust of India (PTI) quoting the All India Sarafa Association. Gold prices fell slightly by Rs 5 on weak demand, but a firm global trend overseas capped the fall, traders were quoted as saying in the PTI report. On Thursday, gold prices had declined by Rs 270 to Rs. 34,180 per 10 grams at the bullion market. 1. In the national capital, gold of 99.9 per cent and 99.5 per cent purities dropped by Rs 5 each to Rs 34,175 and Rs 34,025 per 10 gram, respectively. However, sovereign gold held steady at Rs 26,100 per piece of eight gram. 2. Globally, gold traded higher at $1,309.24 an ounce, while silver held steady at $15.63 an ounce in New York. 3. According to news agency Reuters, scrap gold supplies in India, the world's second-biggest consumer of bullion, may increase this quarter as a rally in local gold prices has prompted consumers to sell old trinkets and jewellery. This may cause gold imports to continue to fall this year which could weigh on global prices that are trading near their highest since the end of April. Falling bullion imports could help reduce trade deficit and support the ailing rupee. 4. 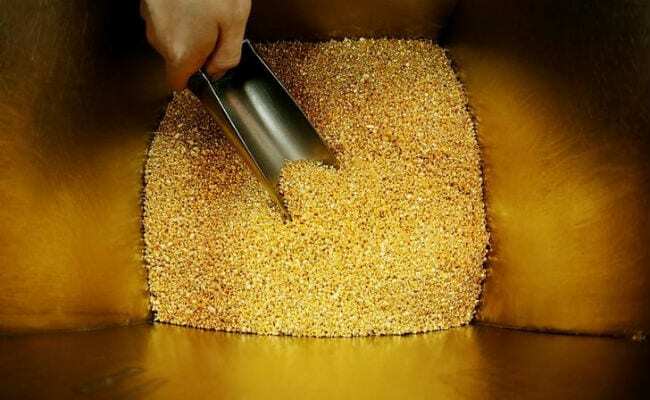 Falling demand for new gold caused country's imports in 2018 to drop 14 per cent from the year before to 756.8 tonnes, the World Gold Council said in an estimate released last week. 5. Meanwhile, silver ready slumped by Rs 570 to Rs 40,930 per kg on Friday, while weekly-based delivery lost Rs 571 to Rs 39,829 per kg. Silver coins held flat at Rs 80,000 for buying and Rs 81,000 for selling of 100 pieces.